The summer is over and the kids are back to school. While we would recommend year-round camping in our beautiful country, the fall and coming holiday seasons means most of us have much less free time to get outside. It’s time for many of us to park our RVs for the winter. If you’re new to RVing, don’t make the mistake of just parking your rig in storage. There are a few steps you should take before tucking your RV away for its winter hibernation. Follow all these, and your rig will bounce back to life in the spring. Frozen pipes mean cracked pipes. To avoid freezing, fully winterize your water system. Each unit has specific water system winterization guidelines to follow in your owner’s manual. Larger RVs equipped with washing machines, dishwashers, and ice machines, will require a few extra water system winterization steps. All units follow the most basic steps: First, ensure the water heater is off, then drain and flush all pipes. To remove every last drop of water, open all faucets while draining. When filling the system with antifreeze, make sure that the antifreeze reaches all faucets. Even pour antifreeze into all the drains. Pro tip: When prepping your water system for antifreeze, it’s best to install a water heater bypass kit. The bypass kit avoids wasting antifreeze on the water heater. 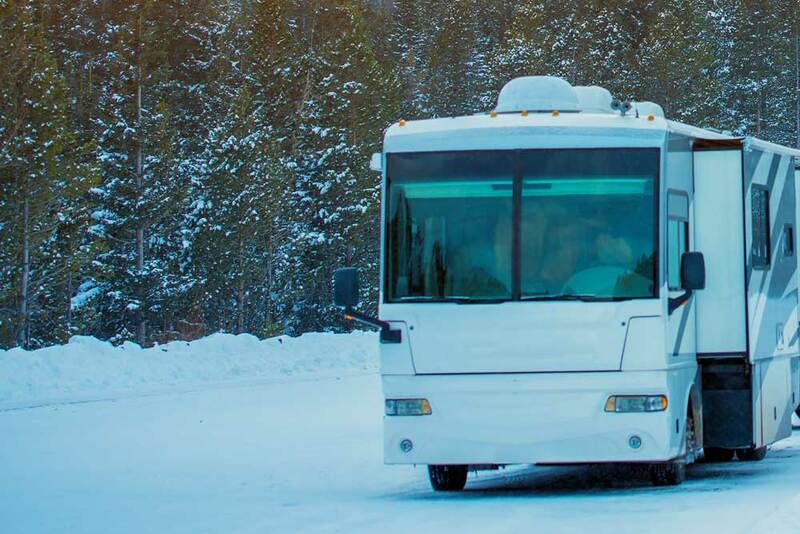 Winter temperatures are your RV’s worst predator. For all batteries, turn off the RV’s disconnect and breaker switches. Also, when disconnecting batteries, remove the negative cable first. If your cables aren’t labelled already, add labels to easily reconnect when you pull your RV out of storage in the spring. Single batteries are easy to winterize. Store fully-charged batteries in a warm, dry spot. Do not store batteries on a concrete floor, unless you want a dead battery by the end of winter. Concrete slowly drains the power from batteries. Larger systems with multiple batteries will have specific instructions in the owner’s manual. It’s usually better to keep these batteries installed. If leaving your batteries in your RV, still disconnected the negative battery cable. Check the battery charge level periodically throughout the winter, and recharge when necessary. Winterizing your RV means protecting it from all elements. To protect the exterior shell of your RV, purchase a good quality wax or protectant formula that is compatible with the composite of your unit. First, completely clean the exterior while checking for cracks or split seams. If you noticed any cracks while cleaning, patch these areas with a sealant specific to the materials of your RV. Then, wax the entire exterior. While cleaning your RV’s exterior for waxing, clean and dry the awning. Two birds in one step! It’s important to make sure the awning fabric is completely dry to prevent molding. The same goes for pop-up or fold-out trailers with fabric or canvas siding. Nothing worse than the smell of mildew. Yuck! While cleaning your RV’s exterior and awning, you should also clean the exterior of your air conditioning. Remove, clean, and replace the air conditioner’s filters before tucking your RV away for the winter. The goal is to leave your rig clean and dry so there are no surprises in the spring and people often forget about doing maintenance on the AC. This step is quick and easy, but just as important as the rest if you want a well-working RV in the spring. Take a few minutes to lubricate your locks and hinges before stowing your RV to avoid creaks, jams, and breaks in the spring. A little lubing goes a long way! If your RV is going to be stored untouched for the winter months, you want to leave it sparkling clean. Again, you don’t want any surprises in the spring. A clean RV offers fewer hiding spaces for critters and mold. And by clean, we mean sanitize! Aside from general cleaning, remove all clothing and blankets to be stored at home. Lift couch cushions and mattresses, and leave them propped against each other or walls for optimal airflow. Obviously, it’s a good idea to take out any leftover food and beverages. There are a few options to minimize moisture damage in your RV. If you plan to store your rig nearby with a power source and can check on it often, running a dehumidifier a few times throughout the winter will do the trick. Another option is to leave moisture absorbing materials inside the RV for the winter. Damprid RV is a popular moisture absorber. The last step, if you will be storing your RV outside, cover your wheels to protect them from the elements like sun scorching. The jury is out on whether covering the entire RV with a tarp is a good idea or not. On one hand, it protects the outer shell from snow and debris. On the other side of the debate, a tarp could trap moisture so if you do cover it, be sure to use a breathable shell. If you’re a seasoned RVer, you know the importance of taking your time to properly winterize your rig. Let us know if you have any secret tips and tricks that make winterizing a little easier!